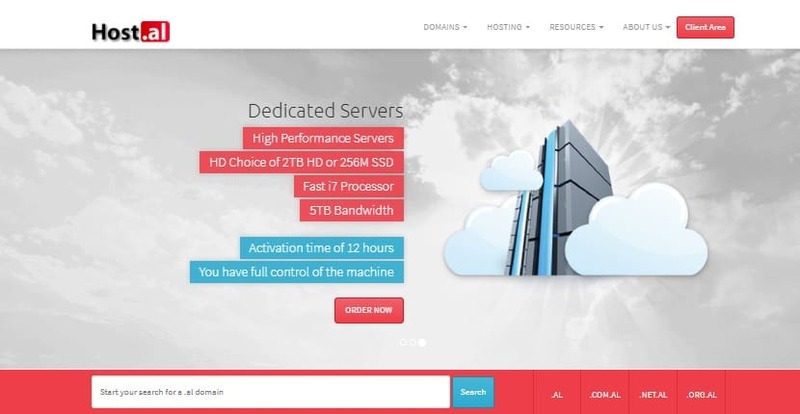 Host.al Review 2019: Is Host.al a Good Hosting? Host.al is a branch of ShqiperiaCom Shpk, which has been providing cheap web hosting and domain registration services to thousands of customers in Albania and the Balkans since 2002. This company’s data centers are located in the United States, Albania, Germany, and France. The clue is in the name. With more than 10,000 domains hosted on their servers, Host.al is a leader when it comes to domain registration and web hosting services in Albania. Their servers are colocated in Europe and the U.S.A., and they host websites of all shapes and sizes for personal, corporate, government, and institutional customers in the Balkans and around the world. Their own website is in English and Albanian. Host.al has invested in top-of-the-line infrastructure, which enables them to deliver high-performance hosting with 99.9% uptime. Their dedicated servers are powered by Intel Quad-Core CPUs connected to SSD drives, so you can expect your website and apps to load fast. Local Albanian customers who want to benefit from the local network are plugged into local machines, but they still have the option of choosing servers located in Europe and the U.S.A. Setting up a blog or database-driven CMS website is super-simple. Thanks to their WordPress-ready shared hosting (with up to 25 GB transfer bandwidth) you can set up a complete website or personal blog within minutes. Just deploy WordPress from the Softaculous app installer, then configure the database and user credentials. The installer also supports other popular CMS systems such as Nucleus and Textpattern, plus a number of e-commerce apps. If you’re not afraid to tinker with code, you have a suite of scripting languages such as PHP, CGI, and Ruby at your disposal. All Host.al’s shared hosting accounts come with the cPanel control panel, which is one of the best hosting management tools on the market, and which can be accessed remotely from any web browser. You can acquire add-on domains, set up your emails and databases, upload websites and files, and do so much more. Best of all, you don’t need technical knowledge to find your way around the dashboard. With Host.al, you get competitive prices for your web hosting and server rentals. When signing up, you can choose yearly, biannual, or triannual billing cycles. Host.al owes much of its success to a friendly and efficient 24/7 technical support team that boasts a vast amount of hosting experience. Although you can call the company, they prefer you first to use their online ticket support system which should assure you a response on average within four hours during the business day. If you’re technically savvy enough to support yourself, I’d advise you to check the knowledge base and blog posts that cover various aspects of web hosting and account management. With more than ten years of experience in the hosting industry, Host.al is a fantastic choice for anyone looking for cheap Albanian domain names and WordPress-ready hosting for personal or corporates websites. Wondering how Host.al stacks up against other Web Hosting companies? Enter any other Web Hosting company and we will give you a side-by-side comparison.